Crystaldrift Cave is a small cave that serves as the resting place for a follower of Kynareth. It is home to leveled animals. The path to the cave is a short way past Snow-Shod Farm coming from Riften. It winds its way around before reaching a fork in the path: taking the right-hand path takes you past the cave entrance. It then loops around the rock outcrop that the cave is formed from, passing a path to Lost Tongue Overlook and a dragon mound before completing the loop along the left-hand path. 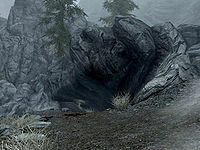 As you approach the cave there are up to two leveled animals standing guard, by a dead deer. Blood is splattered all over the ground around the mouth to the cave. Following the loop past the cave, to the south, you come to a corundum ore vein on the right after a short distance. As you enter the cave, there will be a random grouping of animals which may attack each other first. After descending an earthen ramp and entering the cave proper, there is a pile of eight portions of grilled leeks that have been knocked out of a long open box in front of you. 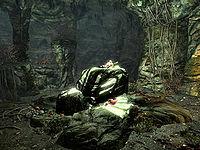 To the right, on a large rock against the northeast wall is a Shrine of Kynareth, with a random potion, a bottle of alto wine, a plate holding five loose septims and several lit candles around it. In the western quarter of the cave is a camp consisting of a camp fire, with a cooking pot hanging over it and a couple of pots containing three leeks and three carrots. There is a hay pile against the west wall, with a rack to the right holding two bunches of dried elves ear. To the left of the hay pile, against the southwest wall is an unlocked chest containing minor loot. There is also a barrel containing ingredients with an apothecary's satchel on top near the fire. On the other side of the fire next to a rock pillar is a crate with a basket of cabbages and potatoes and a few more loose vegetables on top. In the center of the cave is a large flat-topped rock. Resting on top of the slab are the remains of a Bosmer adventurer named Gadnor laid out with his unique Staff lying next to him. He is carrying a copy of the Restoration skill book Mystery of Talara, v 2. Around the rock are three Dragon's Tongue plants, with several fungi found throughout the cave. To the northeast, near a shallow pool of water, is an iron ore vein. At the rear of the cave, a short way up an earthen ramp against the south wall, is a moonstone ore vein. This page was last modified on 30 November 2017, at 17:33.